Working with a virtually complete phylogeny of Viburnum, we are in a position to critically analyze shifts in diversification rate and their underlying causes. With current graduate student Beth Spriggs, we are exploring possible relationships between diversification and measures of environmental heterogeneity, and how such relationships relate to our interpretation of character evolution. With current graduate student Brian Park, we have started a project centered on the evolution of enlarged sterile marginal flowers (SMF’s) that characterize the inflorescences of nine Viburnum species in four widely separated clades. This includes SEM studies of SMF development and studies of SMF function in the field in relation to pollination and fruit set. 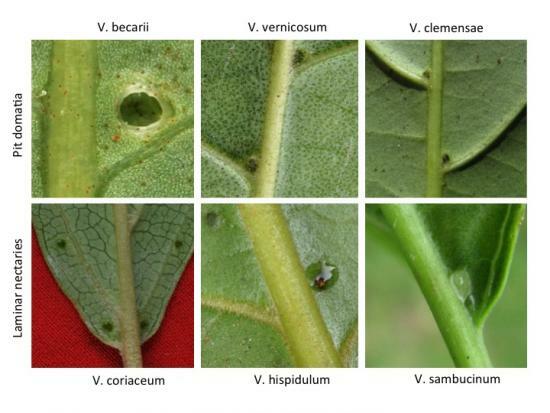 With colleagues at Cornell University (Anurag Agrawal, Marjorie Weber, Gaylord Desurmont) we are continuing to study the distribution and function of extrafloral nectaries, domatia, and various defenses against herbivores. Desurmont, G. A., M. J. Donoghue, Wendy L. Clement, and A. A. Agarwal. 2011. Evolutionary history predicts plant defense against an invasive pest. Proceedings of the National Academy of Sciences USA 108: 7070-4. Weber, M. G., M. J. Donoghue, W. L. Clement, and A. A. Agarwal. 2012. Phylogenetic and experimental tests of interactions among mutualistic plant defense traits in Viburnum (Adoxaceae). The American Naturalist 180: 450-63.